Massive multiplayer online role-playing games are games where a huge amount of player assume the roles of characters in a fictional setting. Children of Ur is a free game. This means that the source code is available to be studied, modified, and distributed. Most projects look for help with testing, documentation, graphics, etc., as well. Children of Ur is an MMORPG that is based on the public domain source release of Glitch. However, the source code was ported from ActionScript to Dart. The game is still in pre-alpha state. One of the notable aspects of Glitch was an intentional focus away from combat, and Children of Ur follows the same path. There are two parts of the software: coUclient and coUserver. Crossfire is a free game. This means that the source code is available to be studied, modified, and distributed. Most projects look for help with testing, documentation, graphics, etc., as well. Crossfire is a Massively multiplayer online role-playing game created by Frank Tore Johansen. It is licensed under the GNU General Public License. Mark Wedel is the current maintainer of the project. Deliantra MMORPG is a free game. This means that the source code is available to be studied, modified, and distributed. Most projects look for help with testing, documentation, graphics, etc., as well. 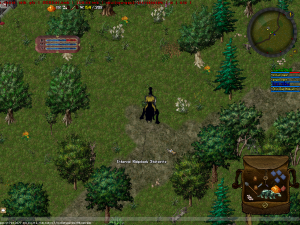 Iris2 3D Client - for Ultima Online is a free game. This means that the source code is available to be studied, modified, and distributed. Most projects look for help with testing, documentation, graphics, etc., as well. Iris 2.0 is a highly customizable cross-platform open-source 2D/3D client for playing the MMORPG "Ultima Online" (tm) on Freeshards. 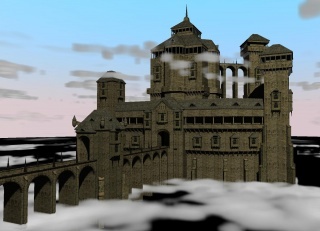 Iris2 uses the Ogre3D engine and Lugre, a middleware to use the Lua scripting language. Iris2 has reached a playable state, but development continues. Massively multiplayer online role-playing games is a free game. This means that the source code is available to be studied, modified, and distributed. Most projects look for help with testing, documentation, graphics, etc., as well. Peragro Tempus will be a free multiplayer online role-playing game with a persistent world, which evolves according to nature and its inhabitants (players and NPCs). It has been in development since 2005, and is being built by a dedicated group of volunteers. Peragro Tempus is written in C++. Ryzom is a free game. This means that the source code is available to be studied, modified, and distributed. Most projects look for help with testing, documentation, graphics, etc., as well. Ryzom (also known as The Saga of Ryzom) is a 3D MMORPG game. Starting as a commercial, proprietary game, a commercial success didn't follow and the game has been released as completely free software, including the server code and media, in a campaign called Free Ryzom! This has been seen as one of the biggest contributions to free software gaming. The game is now free to play with most content accessible, with an optional subscription for covering the maintenance costs. It has won 2005 reader's choice best story award. Ryzom features PvE, consentual PvP, crafting, advanced mob AI (such as carnivores attacking herbivorous herds), dynamic environment (with changing weather and seasons), 4 playable races (so called homins) and a classless RPG system. There exists an extensive number of associated projects and web resources, such as Ryzom Commons – a repository of free-licensed resources related to the game. These include the game assets and user contributed media, such as screenshots, that can be used e.g. at the official Wiki. Another interesting project is Ryzom Armory – a website offering detailed info on individual players, guilds (only those who explicitly make their info public), the game world etc. The Mana World is a free game. This means that the source code is available to be studied, modified, and distributed. Most projects look for help with testing, documentation, graphics, etc., as well. The Mana World is a 2D MMORPG in development, licensed entirely under the GPL, including the server software, the server data, and the client data. The server uses a fork of eAthena called tmwAthena. There are currently plans to switch to the Hercules server which is widely used, and has more features than the current server. The Mana World developers currently recommend using the ManaPlus client, which is developed separately from the server. The latest client release is ManaPlus version 1.5.7.4. Manaplus is also licensed GPL. Wograld is a free game. This means that the source code is available to be studied, modified, and distributed. Most projects look for help with testing, documentation, graphics, etc., as well. Wograld is a Massively multiplayer online role-playing game created and maintained by Lori Angela Nagel. It is licensed under the GNU General Public License.